As we’ve noted in previous posts, the Temple Mount in Jerusalem (where the First and Second Jewish Temples stood) is the holiest site in Judaism. The Western Wall, on the other hand, is merely the holiest site where Jews are currently permitted to pray – an uncontroversial, firmly established fact we leveraged to prompt a correction to a story at The Telegraph on Oct. 24 which falsely claimed that the Western Wall was the holiest site. Other news sites which have corrected their original false claims over the significance of the Western Wall include the LA Times, the Washington Post, the Chicago Tribune, and the BBC (corrections which were prompted over the years by CAMERA). In contrast to these corrections, however, the Guardian has engaged in characteristic obfuscations and stonewalling in refusing to revise Harriet Sherwood’s false claim regarding the Western Wall back in June. Here’s Sherwood’s erroneous claim, which still hasn’t been amended. 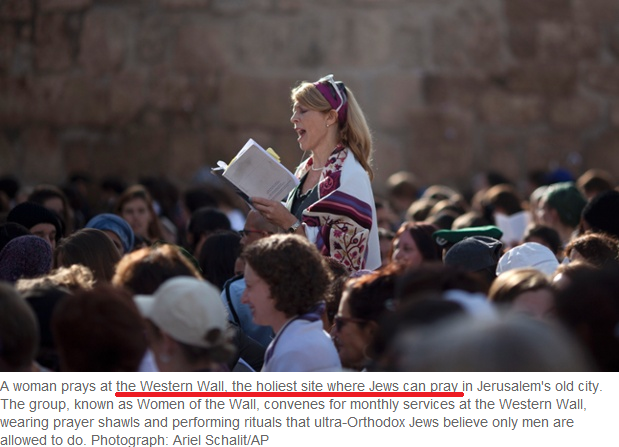 So, we were quite surprised to see the following caption accompanying a Guardian photo of a member of ‘Women of the Wall’ praying at the Western Wall (10 Photo Highlights of the Day, Nov. 4). Whilst this is of course merely a photo caption, Guardian editors have, on occasion, revised such accurate descriptive text below their photos when they believed it to be misleading. So we’ll continue to monitor this entry and see whether this inadvertent collision with accuracy is eventually ‘rectified’. David Ward MP : I merely said that ‘Israel should never have been created’. This caption is misleading in another way. It says that the women are “performing rituals that ultra-orthodox Jews believe only men are allowed to do”. I thought that this was the common view across all brands of Orthodox Jewry, not just the “ultra”-orthodox. In fact, I can barely remember any designation of Jew being mentioned in the MSM other than “secular” and “ultra-orthodox”. It is almost as if they are only interested in the extremes! Surely not. Thanks Adam. I stand corrected. My rabbi happens to be a leader within the Beit Hillel movement, and I get to hear about their activism (on gender issues and other topics) within orthodoxy on a regular basis. On this occasion, the Guardian is technically correct. In the absence of government permission, reinforced by past rabbinical edicts banning open prayer on Temple Mount, the Western Wall IS the holiest site where Jews can pray. Anyway, well done, this clearly points to your sucessful work of correcting false informations, bad or no knowledge at all in a mass media.. I am suspicious of these “Women of the Wall” because some of their leaders are linked to anti Zionist / pro terrorist organizations . Even then there’s a comma missing (after “pray”).